If you are a fan of Shark Week or Sharknado then this shark crochet hat is for you! It would also make an adorable halloween costume or a fun fall/winter hat! If you have trouble figuring out where to place the second earflap see the picture tutorial at the bottom of my Crochet Puppy Hat Pattern. With the same gray yarn you will want to single crochet around the earflap edges and back of hat. NOT the front are of hat where the teeth will go. Weave in loose ends. Working in BACK LOOPS ONLY, attach yarn on the front side of the hat at the first stitch next to the earflap. Chain 2 and DC across front area of hat (all the way to the second earflap). Fasten off and weave in ends. Working in the FRONT LOOPS ONLY, attach yarn to the front loop of the stitch where you began the gums, chain 4, *SC in second chain from hook, HDC in next chain, DC in last chain. Now you have created a triangle! Skip 2 stitches and Slip Stitch to the next stitch. Chain 4 and repeat from *. Fasten off and weave in ends. Feel free to continue this pattern (I hope you can see how this pattern increases by now) to make the fin as large as you would like. When it’s the size you desire, fasten off and leave a long tail to sew onto top of hat. Stuff lightly with poly-fil (or extra yarn) and sew onto top of hat by weaving tapestry needle under the last row of single crochets and then through the hat. Sew black buttons on for eyes, or sew on a larger white button and hot glue a small black button on top of the white button (as seen in the hat in the first picture of this post). Enjoy your new shark hat! Sarah, your incredibly cute designs make me want to learn to crochet! This is precious! I'll be sharing with Grandma on her next visit for sure! 🙂 Thanks! You are just amazing, coming up with all these fabulous designs!! Thank you so much, it is really appreciated! You are really creative! How blessed! This is a very good model !!! Thank you so much for your awesome free patterns! They are adorable! I've used your owl hat pattern many times for baby shower gifts and they're always a big hit! I appreciate that you offer these patterns free as my budget is limited. Your patterns are always easy to follow and accurate! Thanks again for your generosity! you are just so so talented! I am so thankful for your patterns. And all of them are so cute! This is so cute! I have a friend who would love this!! Thanks for the pattern! He is totally awesome and I know a little boy- or two who will love them. Thank you! OMG soooooo cute! I just love all of your crafts 🙂 I hope to make this soon! You are a life saver! I am making different beanies for my mother's group bubs who are turning one and I was one short! LINDA TOUCA !!! AMEI !!! possibility of matching mittens on the horizon. I am having problems with this pattern and don't know why. The process for making the beanie is different from your others and I am wondering why. I have made a half dozen of the owls with no issues. Is there a reason you have changed the formula? The doubles do not seem to be lined up. Any suggestions would be appreciated. Making the hat for a great nephew who is looking forward to it. Could I just make the beanie from the owl and then do the additional parts without it affecting the look? Thanks for any help. Hello, First of all, yes you could definitely use my owl hat beanie and then do the shark embellishments! I changed the stitch count since my owl hat because I was getting a lot of complaints that the sizing wasn't coming out right on the owl pattern (too short and wide). So I reworked it and simplified it. You shouldn't have problems with your rows lining up. Do everything just like the owl hat as far as where you start and join your stitches. The only difference is the stitch count. Thanks Sarah. Feeling stupid but cannot find the error and I have been crocheting for over fifty years. Ending up with eleven dc before the double. I know that you are just wanting a four st increase and could do that but geesh I am a bit of a perfectionist and don't like to get something to get the better of me. I find the sizing for the owl hat to be fine. If they wanted it wider just add one more row of increase. Im sure any beanie would work with this pattern, i have made this hat already but unfortunately my child has a huge head and the child size didn’t fit so i am going to make him another in adult size.. I’m sure as long as you add the ear flaps to the right position on the beanie everything else would work just fine because its added on.. i have found in any DC hat that is joined to the last DC then chained up to start the next work they never end up lining up in a straight line mine are always crooked or worked up on a slant.. hope this helps you. I made the shark this week for my grandson. Your patterns are so easy to follow. Thanks! I'm having trouble sewing the fin on just right. Any tips keeping centered and in place while sewing it on? I am having the same problem. 🙁 Did you figure a good way to do it? Are these hat patterns accurate? Everytime I crochet hats from different websites they come out bigger or smaller than they should be. I don't know how you have all the time to create these wonderful crafts. I commend you on your work! I am a crafter too, and sometimes it feels like there is never enough time in the day to get something finished. Bravo for the excellent work! Hi! this hat is so adorable and I was thinking of making it for my boyfriend but I'm getting a bit confused. I'm a beginner crocheter and I was wondering if the chains counted as one of the DCs. If they do, then am I skipping the last stitch in order to keep the count as what you have or am not counting the chain as a DC. I've read that the chain counts as a DC but I'm not sure if that's what you're doing because then I would be skipping the last stitch in every round before joining. 🙁 any help would be greatly appreciated!! I am an experienced crocheter and to answer your question, this pattern does not count the chain 2 as a double crochet. For every pattern unless it states that it means something different always assume that it is as stated. For example: If Sarah’s pattern says chain 2 (chain counts as double crochet), 2DC in first stitch, DC in next 3 stitches, repeat around; then you count the chain as a double crochet and only do 1DC in the first stitch then continue to do 2DC after every 3DC stitches. If her pattern says this: chain 2, 2DC in first stitch, DC in next three stitches, repeat around; then you assume that the chain 2 does not count as a double crochet and continue with the pattern. Also if the pattern does state that the chain 2 counts as a double crochet, you would join in chain stitch not the double crochet. 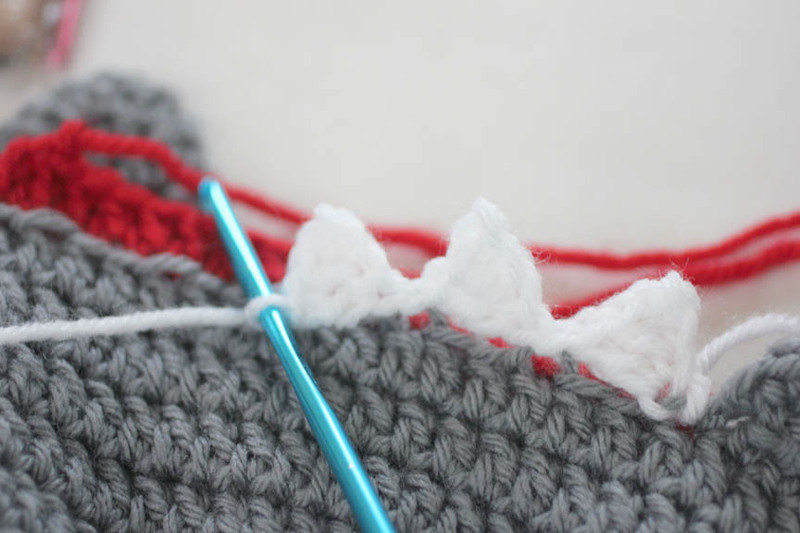 If you are not counting the chain 2 as a double crochet then join in the first double crochet. I hope this was helpful and that I wasn’t to confusing. Good luck! I am new to crocheting as well and ran into difficulty here also. If you don’t mind, I have a follow-up question to your response. 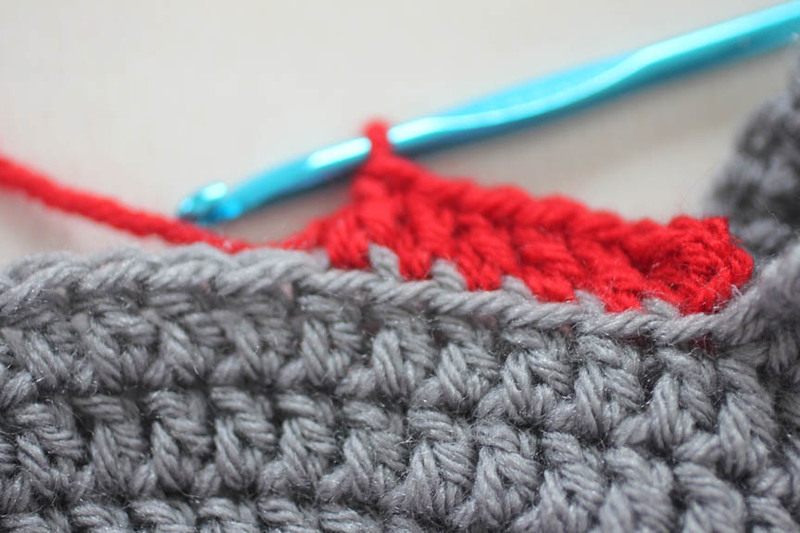 So, it sounds like we should join to the the first double crochet and not the chain? Doesn’t that create a bulge? Also, the first step of the pattern says to do a magic ring and then DC 11. Don’t we need to chain 2 before DC 11? Thank you! Thank you so much! This is SO cute! This pattern is just too cute! I made one as a gift for an Ole Miss fan's grandson. (Ole Miss defense = "Landshark") I stitched "Fins Up" across the back in black yarn. Everyone loved it! Thank you so much for all your easy to follow, free patterns! Thanks for sharing this great pattern! I´ve adapted it for a cat (just posted the photos here: http://linhasimaginarias.blogspot.com.br/2015/05/gorrinho.html). Okay, so I've tried this pattern with a J and a K hook for the teen/adult size and it's still not big enough; recommended hook size is roughly an H. It's large enough to fit a twelve year old's head but that's it. It doesn't appear to be wide enough. Any suggestions would be most helpful. Which size do you make if the hat is actually for a cat? Very cute hat! I made this for my nephew but the hat seems too small ie not enough of the head covered as in your photo. I think if I make this again I would add at least two more rows before the ear flaps if it was to be used as a winter hat and not a costume/play thing. Thanks for the pattern and creative idea. I saw this on a baby in a store the other day and his mom gave me your website name. It is darling and my youngest grandson loves sharks! I just wondered if you could work out how to make the fin a big longer front – starting to back on the hat – and a bit taller? It would look more like a real fin. I’m really going to get this done for him. BUT I’d like the fin a bit more pronounced…..I can crochet pretty well, but not sure I can redo that part of this hat!! I made this hat for my godson and he loved it! I have made a few of your patterns for my daughter too. All your patterns are magnificent! Thanks for the share!!!! Great pattern, runs true to size The only difficulty I had was attaching the fin. I changed out the colors to match up with the San Jose Shark logo for my great nephews who are huge hockey fans. The boys love them. great patern just noticed on the fin the numbersfor the rows jump. still able to fallow just thought I would point it out. Hi! Love this pattern! If I used size 1 sock weight yarn with a G hook, do you think it would come out too small for a newborn (14″ head approx) ? I’d like to use it for newborn pictures. What If i used the 3-6 month pattern with the smaller hook and yarn? Secondly, I don’t understand what you mean exactly by “join”. I’ve been crocheting for about 5 years and haven’t come across this except in the context of using slip stitches to join together blanket blocks. Do you have a diagram for how to join the rounds? Thank you! Your stuff is beautiful! 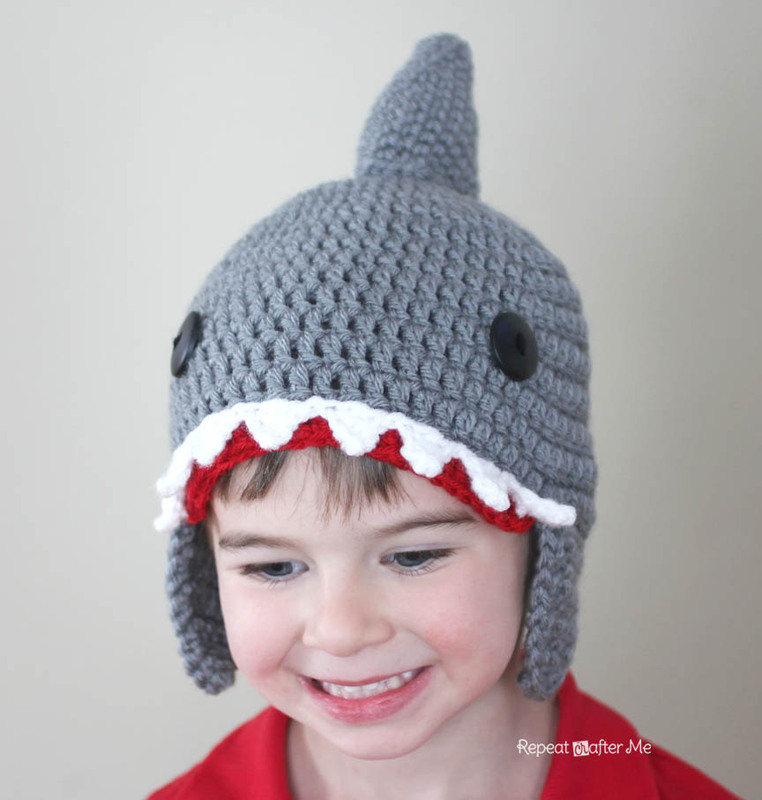 What is the gage for the crochet shark hat pattern? I am using the h hook and worsted yarn, and find my hat is much bigger than the pattern suggests. a gauge would be so very helpful. This is yarn I have on hand, but thought it was about the same as Vanna’s. I appreciate your patterns and looking forward to making several for gifts. Thank you. If i want to double the yarn to make it thicker would i stay with the same size of hook?? Still so nice to follow you. Thanks again for this pattern. Followed your pattern for a gift to my neighbor’s baby boy. They absolutely love it! 17, 18,19 rows are missing… is it suppose to be? 17, 18, rows are missing… is it suppose to be? My son loved it. Thank you for instructions.